My Bright Firefly: A is for Alligator. Feelings. 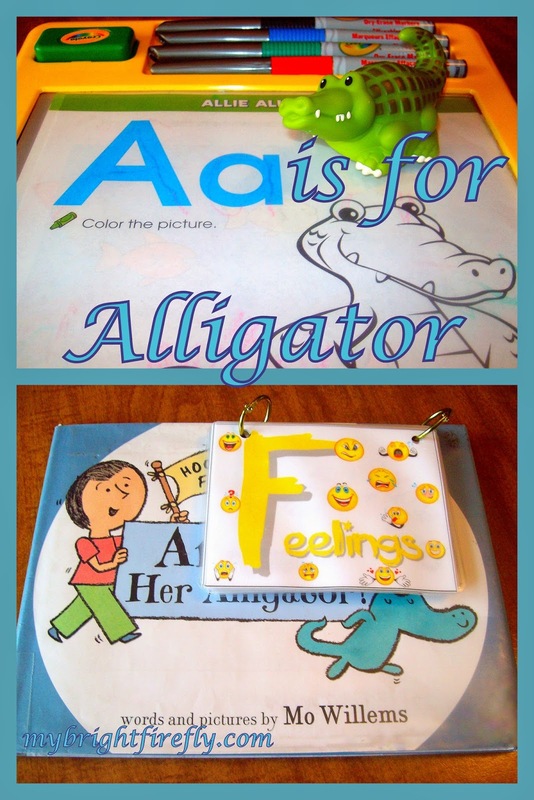 Faces of emotions for children, feelings list with faces, and reading a great book using these resources are our favorite activities for the letter of the week: A is for Alligator. After all, alligators, just like toddlers, can be very emotional and unable to effectively control their feelings... almost. We want our kids to always be happy, healthy, and successful. Instead, they might have tantrums, argue, don't listen, fight for toys... My Firefly is at the end of her "terrible twos". It feels more like a beginning of terrible "I want that... I want that... No!" There are many great resources on this topic. But it all comes to the basics: it is important for preschoolers to learn to recognize emotions before they are able to manage them effectively, I think. I shout with a mighty roar. 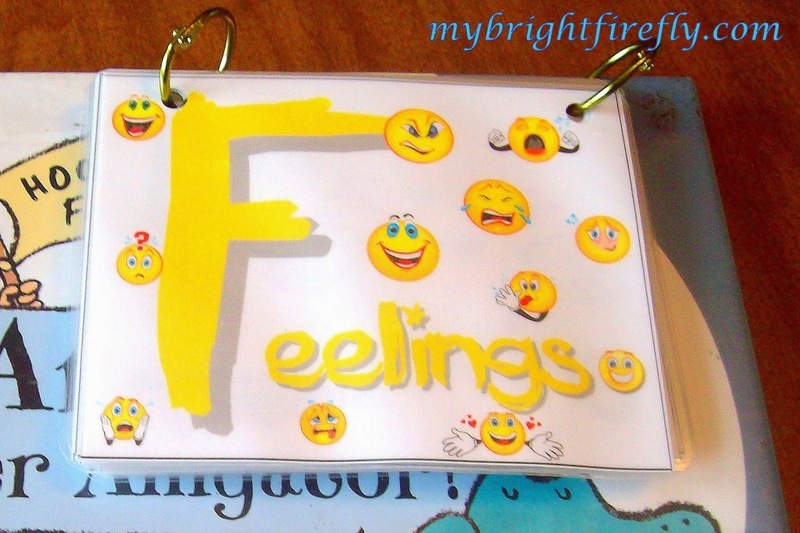 I made this excellent resource, "Feelings" Lap Book for My Firefly using free printables from 1+1+1=1 found here: http://www.1plus1plus1equals1.net/2009/08/feelings-tot-book/. I highly recommend it! It is easy and quick to make. You'd need an old folder and maybe a few envelopes. The book provides endless fun and laughter when "making faces" and exploring life situations using the funny faces. Pictured above: a little book is part of a "Feelings" package. Pages are laminated. Additional benefit: the first letter of each word is nice and big. My Firefly loves to name these letters and trace them with dry-erase markers. to explore feelings for toddlers and preschoolers! In fun and engaging way we followed this alligator's emotional journey using our book of faces. It is a long book, but the scenes and poor animal's feelings change very fast and keep kids' attention for a long time. There is only a sentence per spread filled with fun simple pictures. a cute "Good bye" song everybody loved: See you later, Alligator. "The way I feel" by Janan Cain. The board book version doesn't include all the emotions available in a hard cover book. "The way I act" by Steve Metzger. This is a companion to the first book and explains the behaviors and some "big word" concepts. The Way I Feel Books by Cornelia Spelman: When I feel angry. When I feel jealous. When I feel sad. When I feel scared. When I feel good about myself. "Happy Hippo, Angry Duck: A Book of Moods" by Sandra Boynton. This classic Sandra Boynton book has great rhymes, as usual. "The Pigeon Has Feelings, Too!" by Mo Willems. Camilla likes the silly stories in the pigeon series. The board book is a shorter version then the hard cover. The bus drive tries to make the pigeon a happy face, but pigeon is not in a happy mood at a time, it goes through several feelings through the book.